My Weekend Doris dress and sweater pattern is out with the testers, I'm already getting some great feedback, and hope to have the pattern ready for sale by the beginning of March. One of my testers wanted to know if it was possible to use a woven for the pattern. Stretch fabric is recommended, but curious I had a play and with a little alteration it is possible. 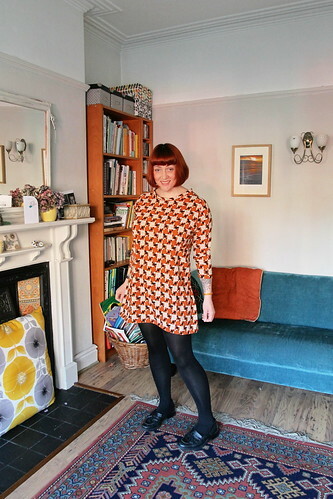 This Doris is made using some printed poly, a fairly lightweight dress fabric. I cut the front one size up from my usual size to accomodate my full bust, but graded down two sizes smaller at my waist and hips, for a hopefully slightly more streamlined dress. The back was cut in my usual size ,but again graded down at the waist and hips, with seam allowance added at the centre back to insert a zip. The resulting dress works pretty well. The sleeves are slightly snug at the cuff, so if I wanted to do this again I would add more to the bottom of the sleeve. Others might find they needed to add more to the width of the sleeve along the whole length. I wish I had interfaced the neckband, it stands up in a cute way, which I like, but would've been better with some body to hold it in place. The neckband could be left off all together, and replaced either with a facing or bias bound edge. Maybe I'd add inseam pockets next time too. Are you sick of these dresses yet? I'm sorry if you are, but there are more to come! I thought you might want to know!